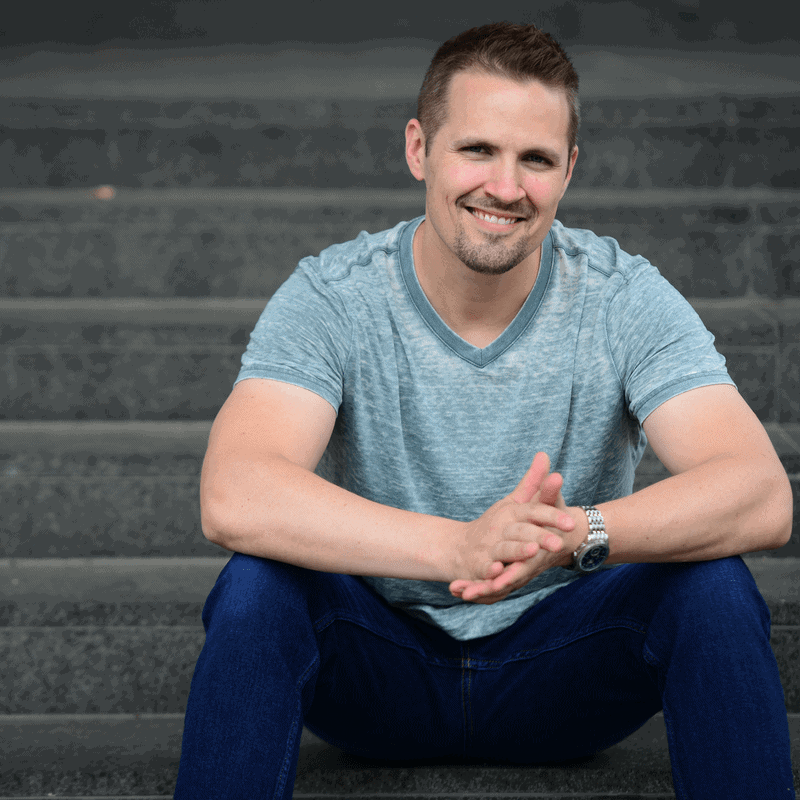 If your life is anything like mine used to be – you probably know how hard it can be to build a real estate business while holding down a full-time job. If you have a family, friends, hobbies and a life – you probably know that it can get even more complicated. I had a full-time, 8 – 5 job (I worked in commercial real estate banking) that consumed anywhere from 40 – 60 hours per week. I have a wife and two kids – each of whom requires (and fully deserves) a substantial slice of my time each day. Every week, I would put significant time and effort into publishing content for my blog (and a few others). I'm an active member of my church, neighborhood and a couple of local economic groups where I regularly participate in several extracurricular activities each year. I have a handful of other hobbies and fun activities that I thoroughly enjoy spending my time on (and without these things, I would probably lose my sanity). Some days, it was totally feasible for me to keep all of these things working together in perfect harmony. Other days, it was a major challenge to keep it all straight. When one or more of these segments of my life started getting busy – life would get overwhelming very quickly. 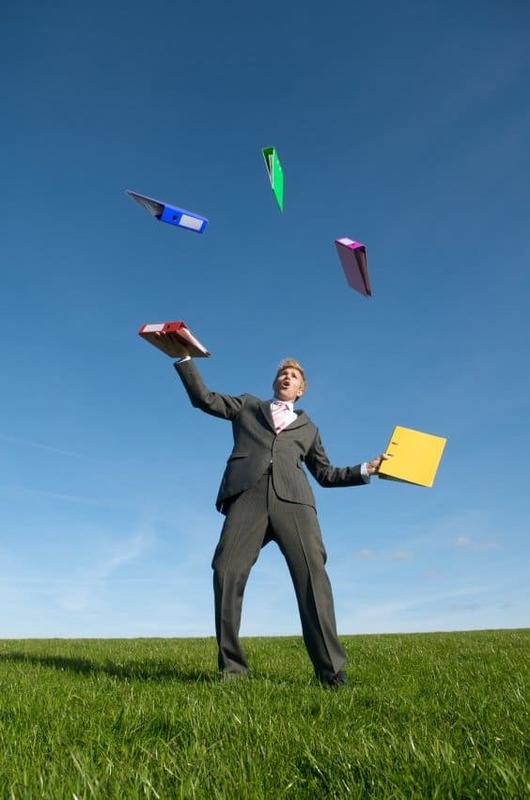 Most successful real estate investors are familiar with this juggling act. 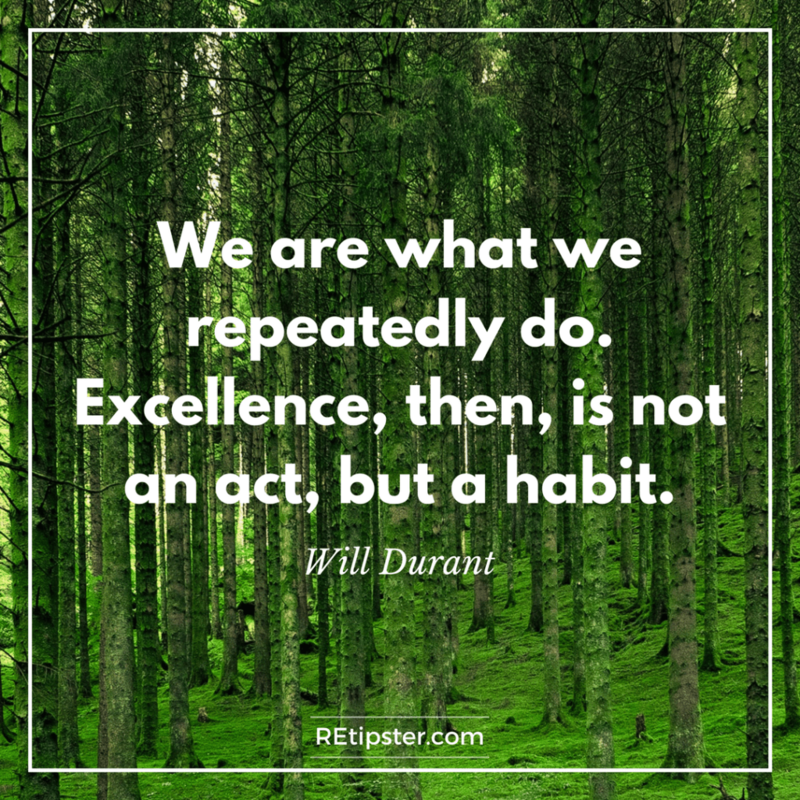 It's an essential first step for many of us… but how are YOU supposed to take care of all your pre-existing obligations AND carve out the time you need to run a profitable real estate investing business? Depending on what projects were hot on the burner, some weeks required that I devote substantially more time to my Rental Properties (if I was buying a new one), or to my Land Business (if I had a big transaction in the works), or to my Full-Time Job (when I got slammed with a massive load of projects to work on) – but all in all, if I averaged out all of my various working activities over the course of an entire year, this was probably the most accurate representation of how my time was spent back when I had my full-time job. And to be clear, this was my “working life” – so it excludes things like being a parent, husband, and other standard duties like cleaning the house, yard work, shopping, fixing stuff, etc. My weekends (and some weeknights after 7 pm) were usually my most productive times of the week in terms of making progress with my various business endeavors. This time was essential to me “getting ahead” so to speak. Again, my global income didn't look exactly like this every year – but for the first 5 years of running my land business, this was how the typical year looked on average. As far as jobs go, I had a pretty good one. I was required to be present at the office for at least 40 hours each week (sometimes more, depending on my workload). My job paid me a set dollar amount, twice every month in the form of a salary. It also provided me and my family with health insurance, which helped contribute to what some people perceive as “security” (aka – a steady, predictable paycheck that we could count on – regardless of what else was happening in life). Of course, this “security” was actually more of an illusion (because I could've lost my job at any point in time, for any reason whatsoever) – but I must admit, it was probably the most dependable source of income I had for several years in my life. With this source of income, it didn't matter how busy I was, how productive I was being, or how much stress it contributed to my daily life. I was earning the same amount of money with every paycheck, regardless of how much time it consumed relative to the other slices of my weekly time budget. For obvious reasons, this kind of fixed income could work to my benefit or to my detriment. The land business is a funny thing (at least, mine is). Depending on the year, I can have a few grand slam deals that generate more profit than the annual income from my job (even though it only consumed a small fraction of the time). I could also have a year with a lot of “fluff” activity and some less-than-stellar results. The month-to-month income can be very “spikey” in nature (especially if there aren't many seller financed deals on the books), and it's not uncommon to have some properties that take longer-than-expected to sell (which simply delays the collection of my income). When I was still working my job, my land business provided less of a feeling of “security” – because it wasn't easy to predict what my income would look like each month and year. However, it did (and still does) generate some HUGE influxes of cash, which played (and continues to play) a pivotal role in building my financial freedom. The only problem is, it's not always easy to predict when these huge influxes will occur. The level of stability (or lack thereof) is also affected by how many monthly payments I've got coming in from the various properties I've sold with seller financing (and these monthly payments can add a lot of financial predictability to the revenue that comes from a land investing business). The important thing I've recognized about my land business is that for me – it's not the only income-generator I want to rely on. 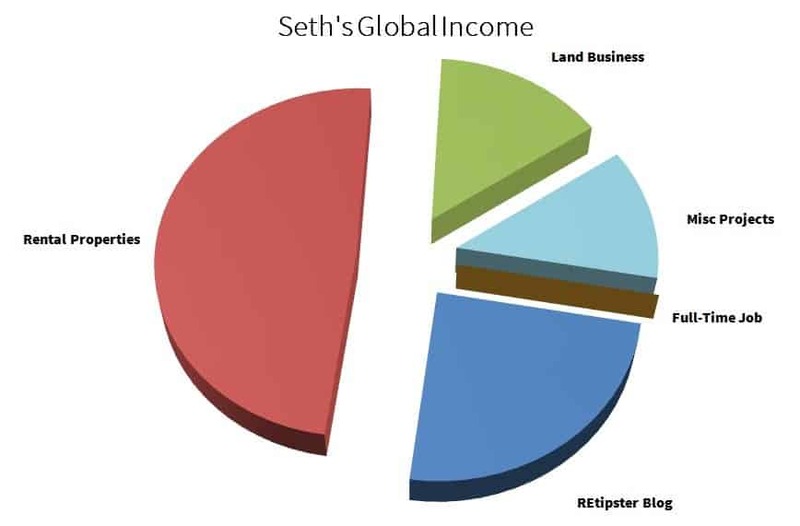 Some land investors choose to focus 100% of their efforts on their land flipping activity, but for me, I've chosen to use it a very effective tool for generating the large influxes of cash I need to pursue my end game. And what is the end game? 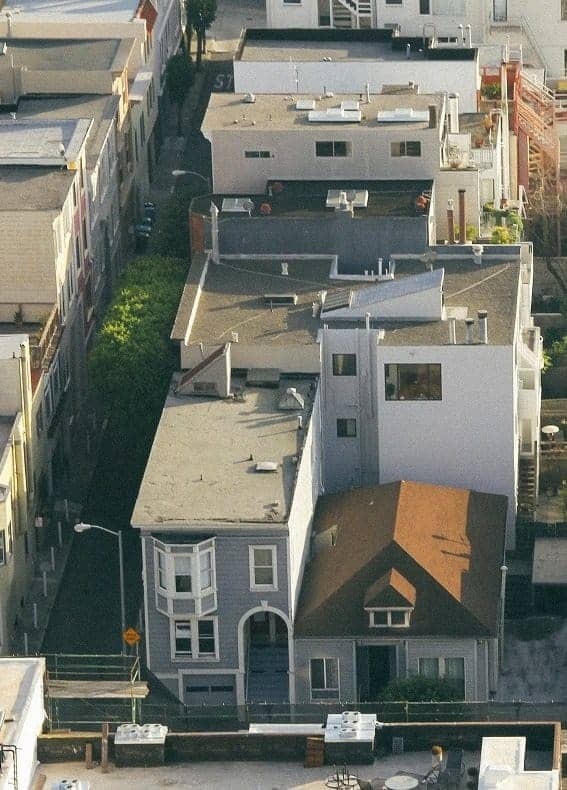 Well… my ultimate goal is to build a large portfolio of hands-free income-generating properties (e.g. – rental properties, farmland, self-storage facilities, and the like). These are separate real estate investments that I buy-and-hold for the long term because they will continually throw off a sustainable income for the rest of my life. Without the cash generated from flipping vacant land properties, it would be very difficult to make this kind of business a reality. At the time of this writing, I would still consider my rental property business to be a relatively small (but growing) operation. It's not quite enough to live off of (yet) – but the beauty of this income is that I only have to spend a couple of minutes each month running this arm of my business (as opposed to 40 hours each week in a day job). Checking the monthly income report from my Property Manager. Verifying that the money has been deposited into my bank account. Making sure there are no looming problems that need to be handled. The only reason I have it this easy is simple – I have a great property manager handling all of my rental properties. In my opinion, a good property management company is an essential component of a good rental property business. With a good property manager in place, my rental properties are literally a hands-free operation that runs itself without my ongoing involvement (and this is very important). This kind of hands-free income isn't easy to create (especially in the beginning), but if you take the time to seek out the right rental properties and buy them the right way, you can experience this amazing phenomenon for yourself. If you ever do, you'll see what I mean – it's a beautiful thing! For a project that once started as a massive time investment with absolutely no guarantee of any tangible revenue (i.e. – pretty much how every business starts), this little business has evolved from nothing into another steady stream of monthly income. It took a ridiculous amount of time and effort to map out and implement the game plan, but the plan seems to be working and it has been a fun way to generate more streams of cash flow. The full-time job is gone and the other businesses are each standing on their own and throwing off more than enough cash to support all of my living expenses (and then some). Of course, it's impossible to know precisely how the future will pan out. There is an endless number of variables that can potentially come into play and change the trajectory of where my life is headed. However, I do believe it's important to at least have an idea of what direction you'd like life to go… so with this in mind, this third pie chart (above) is probably the best projection I can show you. Now that you know how I spend my time, how I make my money and what my end goals are – let's talk about YOU. What would your pie charts look like if you laid them out just like mine above? Where do you spend the bulk of your time? Where is your money coming from? More importantly, how much of that money are you investing in your financial freedom? Do you have an end goal in mind? If so – what does it look like? Sometimes it can be illuminating to see these things side-by-side (and I have to be honest – it was actually pretty revealing for me as I created these three pie charts for this blog post). Just take a minute and think about your daily activities… what are you doing with your life? Are you moving towards the destination you want to reach? Of course, you won't be able to answer these questions until you truly know what you're trying to accomplish – so if you find it difficult to map out the same charts I've shown above, take a few minutes (or hours, if necessary) to organize your goals and figure out where you want to go, and what your activities are doing to bring you towards that destination. If you're lucky, you might just figure out some things that need to change… and better now than never. I have to say that this is such a difficult thing for me. Like you I have so much going on with family, work and real estate that I’m always jumping from one to the next. MY Job takes up 40 hrs per week but it’s easy to schedule around because it’s consistent and constant. Family and friends on the other hand is impossible to schedule. Sure there are the everyday stuff that you can work around. Recently my 2 year old son decided playing is MUCH better the sleeping so it has become a 90 minute exercise to get him to bed when it used to take 30 minutes. That takes 1 hour/night away from my real estate business. That cut my available time in almost half. My only advice is that things are always changing so be as flexible as possible. Come up with a good method for picking up where you left off without having to think about it. Saves a ton of time if you can do that. 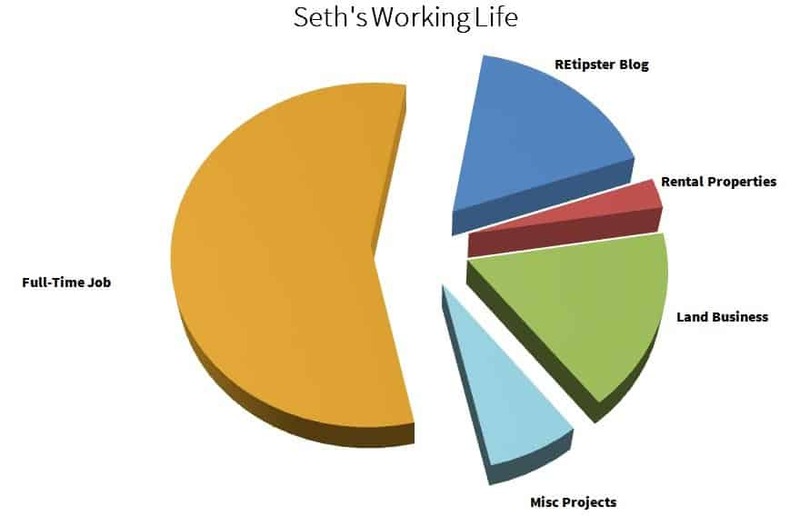 Good post Seth, I always like to read about how other people manage their time. Thanks Scott – I think you’re just a few years ahead of me with the family life. We just had our first baby in early August and even though she’s pretty easy to take care of, it still takes a big bite out of my disposable time (and I’m sure it’s going to get harder as she gets older). I’ve heard that this can actually be a great motivator, because it basically forces us to be much more intentional with our time (rather than wasting it on things that don’t really matter). If you think of any other good time-management ideas, definitely let me know – I’m all ears! I really love your posts. Very inspiring. Now I understand that passive income form rentals is significantly better than any job/business etc. Absolutely Elijah (at least, that’s my theory anyway). I think it can be pretty tough to rely ONLY on rentals, because without a bigger machine (or machines) of income to feed the rental property portfoilo, it can grow really slowly. That’s why it’s important to have those other businesses and sources of income too. I was just thinking about how I need to divide my time between work and other business. I’ve been in RE for a while (different parts of the industry) and I recently took on a gig working for a small commercial developer. 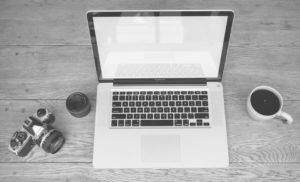 Right before I accepted the position I started (keyword is started) my blog about multiple streams of income – but now I need to factor in how to juggle it all. Some of my income streams actually require my time because I deliver a service. Thanks for the article- what did you use to put those graphs together, might use it in a course of mine. Hi RJ, thanks for the comment – and best of luck with your new blog! Sounds like a pretty interesting topic. I just used Microsoft Excel to put these charts together (there’s a charting function within it). Great article. This is a very inspiring post for real estate agents who also work another job. I work with several realtors and will plan on sharing this with them. Thanks for sharing! Awesome, thanks so much for your interest Alexis! 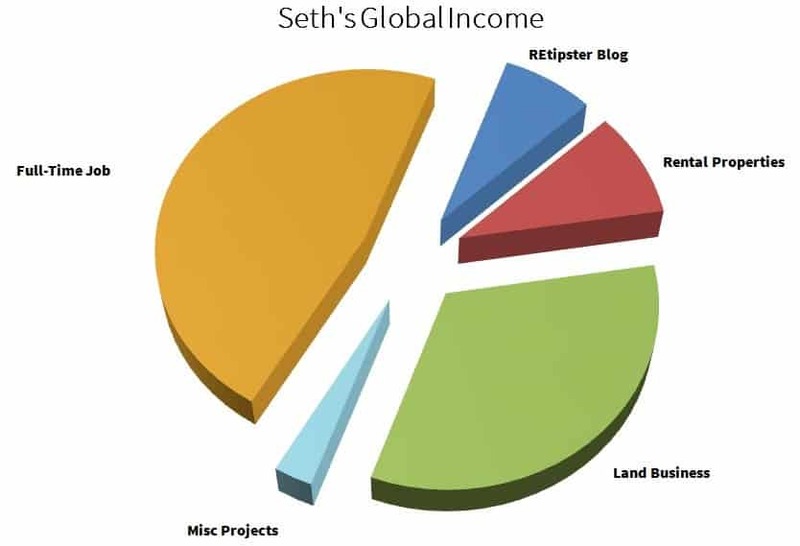 Seth, great website ! I want to get into Land flipping as well and you have been an amazing source of information. I have to ask, is it possible to make a living just of the land flipping ? Assuming you increased your marketing campaign do you think it would generate enough business to leave your job ? The reason I ask is because my goal would be to escape the traditional 9-5. Hi David. Good question – and yeah, I think it is possible (though not necessarily easy). 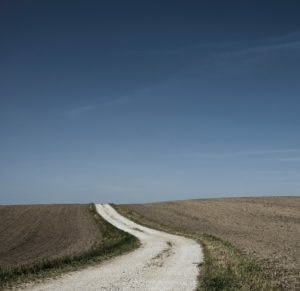 If you want to take the leap, it’ll either take a lot of time upfront (to build up a solid business that throws off some sustainable income) OR it’ll take a lot of risk and seed capital (I wouldn’t recommend this route, because there’s a lot to be learned about land investing – and most people just don’t have the knowledge base coming out of the gate). I know many agents that would say this is impossible to do, myself included. Real estate should be your sole focus and a full-time job. Specially in buzzing cities like Miami, the real estate work never sleeps. You can really make a living out of this and THEN some. 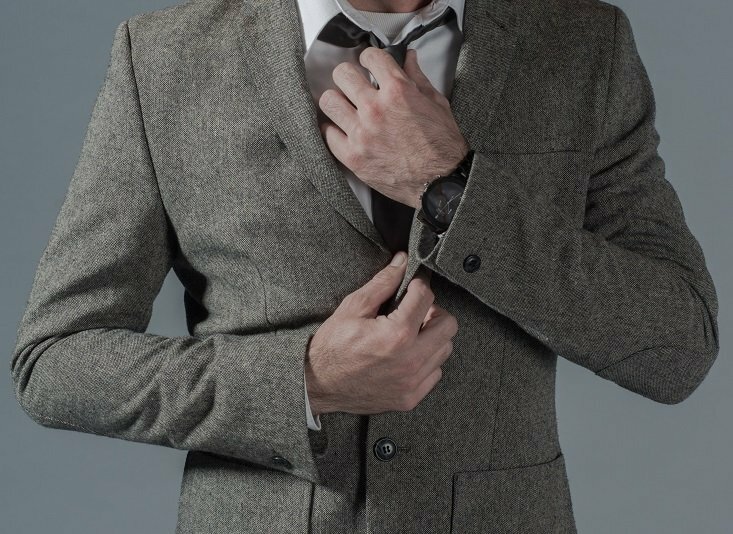 It’s something to be taken seriously and I think this article discourages realtors and takes away from the importance of taking this commitment on full time. Hey Ily, thanks for your feedback. To clarify – this article is actually targeting investors, not realtors. I can see where you’re coming from though – a lot of realtors probably would have a great deal of difficulty juggling their role with a full-time job, as a realtor’s work requires a lot more hands-on involvement with showings and customer interaction (things that investors don’t necessarily have to do in order to succeed over the long term). For now, I am concentrating on the land investing aspect. This does help! Thank you! Your blog is great! Before I ask a question I will be sure to look for previous blogs on the topic! — You have covered some great topics and this website is VERY helpful ! Do you have a single LLC (for both the land flipping and rental properties)? and operate your buying or selling/rent arm under a dba? I have one LLC that handles both the buying and selling of my vacant land properties (I use a dba on the selling end, which allows me to use a different business name on the buying end than the selling end – so I can keep the two activities separate). I also have another LLC that handles all of my rental properties. How do you make money on land? Hi Jonathan – that’s a bit of a loaded question (I’ve got a 12 week course that explain the whole process), but essentially – it’s all about finding motivated sellers, buying their properties for pennies on the dollar, and re-selling them way below market value. You can do this with any type of property, but land is a particularly good fit, because it’s a very simple type of property WITHOUT most of the hassles that other property types are known for. When I started wholesaling to rebuild my life after my ex-wife got on serious drugs and destroyed our life, I worked a full time minimum wage assembly line job. It was monotonous and tiring. What made it work for me was the fact that I wanted out of the job so bad, I had to suffer through being tired and simply do what was necessary. Most people give up and just drone away into a zombie like state. In other words, just do it! That’s the spirit Brandon! Sometimes the pain and monotony is exactly what we need to keep us motivated to push through. This was great Seth, thanks a lot. My situation is a bit different than yours but your story resonates, regardless. I’ve been working in digital media in some capacity (sales, account management, etc.) for almost 15 years now and have a good job. Although the industry is volatile (my company had 2 rounds of layoffs in 2016 alone), my 3-4X/week commute is long (2 hours each way) and I find myself thinking if there’s anything else out there. While my commute should go down to about 2X/week – it’s still a hassle and I hate going for my run at 5AM and getting home after 7; especially with two young kids at home (infant 5 yr old). With some major health issues and my wife on disability, I am deathly afraid of quitting my job and she won’t be able to work for at least a few more months. Now I don’t have any rental properties per-se, but my family owns multiple condos in Hawaii and I’ve always wondered what real estate life was like. We purchased a new home close to the beach and family a few months ago, took on a large mortgage and so you can understand my fear of quitting all together. I’ve recently started an online real estate course to get my NY state license with the intention of becoming a property manager since I live near so many rental properties (the Hamptons). My (long-winded) question was: how long will it take to get a property management job going? Should I start off in real estate first? I’ve just recently realized that I don’t love my job and want a change but the money and security is holding me back. Would love some advise. Hi Joe, thanks for sharing your story. I feel for you man – that kind of commute and those time restrictions would be enough to stress most people out. For most people, it takes at least a few years to start from scratch and make the leap to full time real estate investing… but the time frame and work involved can also have a lot to do with which real estate investing niche you decide to start in. The nice thing about property management is that you don’t necessarily need to own the properties, you just need to find the landlords who need your help (and then convince them that you’re the right guy to hire). I’ve known people who have made the switch within the 3 – 5 year time frame, but they worked very hard at it too. Honestly though, the most important thing is that you’re recognizing you want a change. Once you know things need to be different, you can start looking at the spare time you have in life (even if it isn’t much right now) and start making the moves to change directions. That might mean getting a different job, changing your position where you’re currently working, or any number of other possibilities. Just remember – if there’s a will, there’s a way. I’m currently serving in the military and just recently started my wholesaling business and I have to say it’s pretty difficult starting out. Especially if you have a full time job, for me it’s a 24/7 job and it’s hard to find the time to invest in the business. I’ve already used a lot of my savings in this business so I don’t plan of quitting anytime soon. any advise to a new beginner would be greatly appreciated! Hey Tony – thanks for sharing your experience! I know what you mean, especially in the beginning – the business is VERY time consuming. I’m curious, are you wholesaling houses, land, or something else? I’m currently selling houses but haven’t got one deal yet. The hardest part imo is marketing. If people can’t find you, than your business is as good as dead. I’ve pulled in a good amount of buyers but I’m having a hard time finding sellers. This weekend I’m going to post up bandit signs and hopefully it’ll fetch me some deals. This is truly powerful information that you just shared. I would love to see this as a “day in the life” of an average real estate investor. Since each of us shares the same 24 hours, it’s amazing to see how different people utilize the time. Thank you for provide a truly open perspective on what you are doing. Keep up the great work. Just curious, where are you located? Also, I’m located in Grand Rapids, MI. I really enjoyed reading this since my husband and I are on a similar path. We both work full time at jobs in State Government which have the great benefits you would expect like great retirement and medical coverage. The disadvantage is they don’t pay as much as the private sector but I should hit $200,000 in retirement savings this year which isn’t bad for still being in my 30’s! This will definitely help with early retirement! We bought our first property (a 4-plex) last year with my husband’s VA loan. This was the best economic decision we ever made and has allowed us to stay afloat in a very difficult economy as Alaska went through it’s own recession due to falling oil prices. We live in one unit rent free and the other 3 units pay for the building. I also run two websites! That takes a highly variable amount of time. The more time I put in the more I get out of them but they can coast if need be. They make a small profit now from affiliate sales which is growing each month. We will hopefully be starting as property managers next month as well. My Mom is selling a rental house and investing the proceeds into a commercial 11 unit apartment building. We will be charging 10% of the rents to manage it for her. This will be a substantial extra income but still not nearly enough to replace one of our jobs. Hopefully it will allow us to save up a down payment to buy another building however with an FHA loan. At that point we would move into the new building and rent out the unit we are currently in in the 4-plex. It is a little daunting to juggle all this! We will have 4 jobs between us soon. My husband wants to go to law school as well. I appreciate your advice that the rental property is your long term goal and the other jobs are just the means to the end. That is a great point and basically what I have been planning for years too. We want to get as many buildings (profitable buildings in good condition) as soon as possible. Hopefully the property management income will be the means to that end. That’s awesome Jessica! Thanks for sharing all the details on your journey so far. Best of luck as you continue heading down the path to retirement!